Need more time in arena, 8x+ animation speed! I often time-out in a match when I still have 5 team members alive and I just need one or two more hits to win. This is an extremely frustrating outcome, and I know I'm not the only one who doesn't appreciate this. Please consider adding an 8x option for animation speed, and possibly even a 16x. There is no downside to having this as an option. As the game changes and character kits become more complex, the potential for draws and other boring/annoying outcomes has increased. Imagine how boring arena will become if time-out teams become a viable and widely used strategy. I was under the impression that the Devs added 2x and 4x speed because they understood that having too many arena matches end in a draw was bad for the health of the game; if this is the case then it is again time to add another animation speed option, as it seems like I'm seeing many more time-outs than I have in the past. Or just , ya know, use a better squad. I'm honestly shocked at the responses here. I challenge you to come up with one logical reason why adding an option for 8x animation speed would be a negative for players. And If the new normal in arena is that you need multiple counter teams to be able to compete, then this game is not going to survive long. I'm on a launch shard and finish #1 when I feel like it. Everyone has maxed Traya teams - most 7* all g12+. I have several matches a week timeout and agree with the OP. The introduction of g12+ (with it's strong health, armor and defense bonuses) - especially when it is equipped on all 5 arena toons, with 6* defense mods, leads to longer battles. The defensive bonuses of g12+ and 6* mods are not equally balanced with the lesser offensive boosts. As such, battles take longer. The things is that the "time out" win is a valid strategy for some teams ( phionex and NS and Bastilla ) and you're punishing those players by adding a x8. Just use the counter team to beat them. If you dont have one, hit that refresh button. I challenge you to come up with one logical reason why adding an option for 8x animation speed would be a negative for players. It's already hard enough to hold on defense. This makes it harder. Time-out should not be a viable strategy. It should be heavily discouraged by developers because it leads to the arena becoming extremely boring. No matter how the system is set up, some strategies will be "punished" relative to other strategies by virtue of being less effective. For the health of the game, Devs should "punish" the strategies that produce boring gameplay. I thought that this was implicitly acknowledged when they added 2x and 4x speed. By your logic, 2x and 4x should have never been added. You need to be careful with what you think is implicitly acknowledged. A Game Changer or two talked about the impact on both arenas when 2x and 4x were introduced. They don't work for CG. CG stated it was being done to speed up raids and GW. When Rey (Jedi Training) was released CG (specifically CG_NotARealJedi) referenced her ability to win or hold on defense. Doesn't seem like something CG would say if they were trying to remove draws from arena. Lets not blame those that see survivability(time out) as a valid option. Its a good strategy and you really can take it out because some dont like it no matter how cheap it may seem to you personally. I personally dont like it when teams mass stun me but i cant request that mass stuns be banned from the game. But dont worry there is always around the teams that are giving you trouble. Timing out should never be looked at as a good thing. It's right up there with clock blocking, and if you use that as a strategy, you're the worst kind of person. My brother occasionally times out on Bastila battles with his zzPalp team yet I clear them in less than 2 minutes at 4x speed. Different teams cause different screams I guess. 7* Traya lead Triumvirate teams + Thrawn + Nest. All 7*, g12+ (all filled) and all with 6* defense mods. Fought 3 different ones. One timed out. Finished one with :02 (autoing the last 1:30) and one finished with :14. And what strategy do you employ to hold rank? Also, you're right. Timing out should never be looked at as a good thing. It means you've employed poor strategy. All teams have a solid counter. You just need to find it. Have you met our Lord and Savior, Rex? He works wonders against the Triumvirate and I've seen several comps that do well. I like CLS, Nest, Thrawn, and DN with him. I've seen others use Talzin, Wampa, and Sion in mixes. I've also seen Thrawn (L) with Magmatrooper walk through Traya lead as long as Sion has his zeta. I use a good tank to absorb all the big hits while my attackers wear down their team. As of right now I use traya lead, palp, sion, nihlus, and sith trooper. I regularly beat that team comp in under 3 minutes. People know how to work that team. You'd be out of the top 50 overnight in my shard. Not a great holding strategy. Apparently you missed the "all 7* and g12+" part. This is a launch of shard, not some 5* Traya, g11 4* Nest one Sparky. Rex? Talzin? Wampa? Seriously? Maybe 6 months ago, one or two of those would sneak into the top 50...for a few minutes. Glad that works for you though. In a few months it won't. Hopefully we'll have 8x by then. You're funny. These teams work great on an April 2016 shard against "all 7* and G12+" teams. Give them a try. You won't be disappointed. You're cute. I said 6 months....and April 2016 is about 6 months behind launch shards. Incidentally, had another timeout today - despite autoing the last minute +. When you start facing full g12+ teams, you'll see. I'm not really sure what advantage you think six months in late 2015 to early 2016 gives you for shards and gear from a raid that launched in 2018 but I can assure you were facing very similar teams. 7* across the board, G12+. 316 speed Nest, 301 speed Thrawn. But if you want to look down your nose at advice on how to not time out I'm ok with that. Best of luck! Lol - Numerous people in my shard chat are saying they're having timing out issues as well. I like your selective choices. Notice my screenshot is top 5. 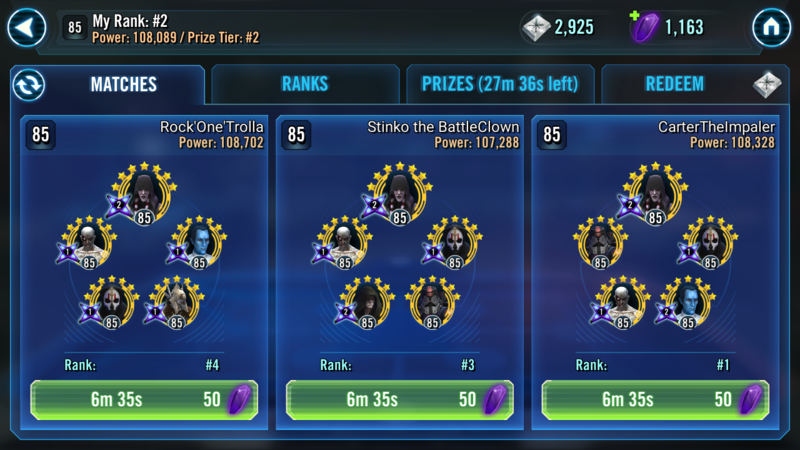 And please, show all the Rex and Talzin teams. I'm not looking down my nose at your "advice". I just find your presuming that a shard 6 months behind has the same makeup of a launch shard short-sighted. But in 6 months, when you're timing out because every team in the top 20 looks like the screen shot I posted (as opposed to a few select ones), don't say I didn't warn you. The selection was meant to show how far down the 7* G12+ teams go. And I've offered all the evidence I can to show that the makeups are, despite your skepticism, in fact very similar. I'm _still_ not sure why you think 6 months of time, during which none of the 5 or 6 characters in the team comps your struggling with, nor G12+, nor even mods, existed, would mean your shard is that different. We're not talking about pitting entire rosters against each other (I'd concede that the 6 months would make a difference there). Just 5 measly characters. But to each their own I suppose. If you really want to believe that those 6 months way back when trump all then I guess all the evidence in the world won't convince you otherwise.